We are very happy to announce the new release of @EmojiWorldBot (v 0.95). – emoji-to-word and word-to-emoji conversion for more than 70 languages. – a tagging game for people to contribute to the expansion of these dictionaries or the creation of new ones for any additional language. 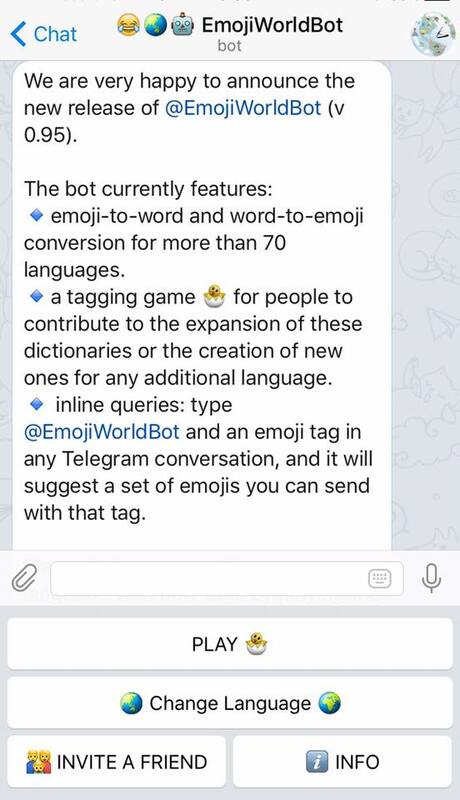 – inline queries: type @EmojiWorldBot and an emoji tag in any Telegram conversation, and it will suggest a set of emojis you can send with that tag. Please help us expanding your language with new tags by playing the tagging game, and invite new friends to use the bot. @EmojiWorldBot is a free public service produced by Federico Sangati (Netherlands), Martin Benjamin and Sina Mansour at Kamusi Project International and EPFL (Switzerland), Francesca Chiusaroli at University of Macerata (Italy), and Johanna Monti at University of Naples “L’Orientale” (Italy).